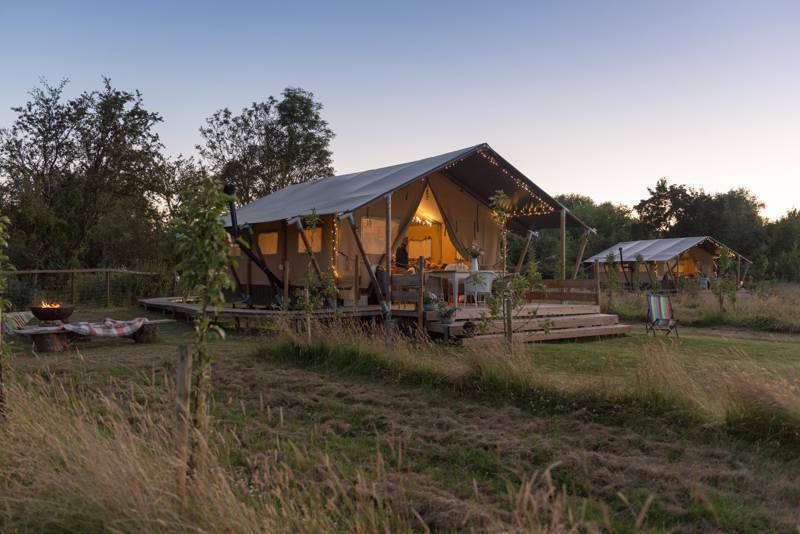 Situated in the Wye Valley and within the AONB our single authentic Mongolian Yurt is totally private with far reaching views of fields and wooded valleys. Maybe it was the crackling campfire, or the wonderful remoteness beneath a starry blanket of unblemished night sky, but when Bridget and Tim Drakeford found themselves camping in the wilds of Mongolia, they knew they wanted to bring some of the magic of the east back to the UK. And while the Wye Valley might be a world away from the rocky peaks and plateaus of the Himalayas, it isn't an Area of Outstanding Natural Beauty for nothing. Nestled in one of the lush, wooded dells that fringe the snaking River Wye, the Drakeford family's Upper Buckenhill smallholding in Fownhope plays host to The Mongolian Yurt. This is the real deal folks. While some of us settle for a knock-off Rolex or some duty-free, Bridget and Tim brought back a bona fide Mongolian yurt! 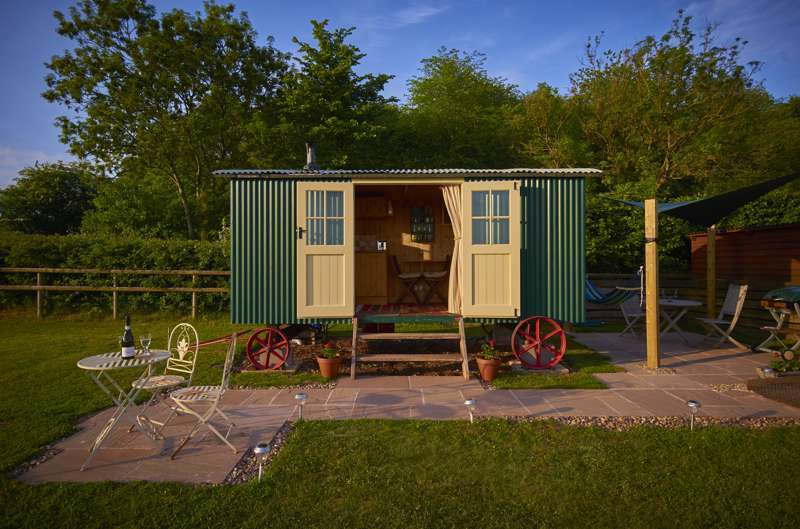 Sat atop pristine wooden decking, this genuine ger comfortably sleeps four in it's yak hide lined interior which, along with a proper wood-burning stove, creates a cosy camping cocoon. The decor is vibrant and practical, with multi-coloured tables, chests, and rustic rugs adorning the floors and walls. You can also admire some images from your hosts' Asian adventure to really set the mood. 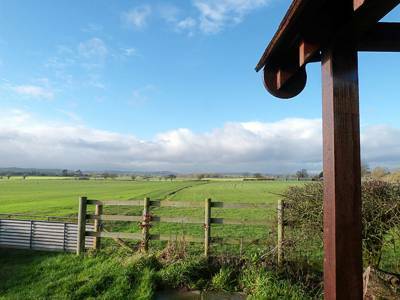 Despite it diminutive size, this smallholding site boasts an astonishing array of wildlife. Substitute the Central Asian steppe for wildflower meadows and an enchanting apple orchard abuzz with all manner of flora and fauna, not to mention the sheep and cattle in the neighbouring field. And should you be able to tear yourself away from this idyllic setting, nearby Hay-on-Wye is a bibliophile's dream. More open-air bookshop than town, the world's literati converge on Hay's quaint cobbled streets every year for the internationally famous literature festival. Saunter into one of the enchanting antiquarian bookshops to discover your next literary gem. And if there's a better place to settle down with a decent read, and unplug (literally) from the buzz and busyness of modern life, the yurt at Fownhope gets our vote. An authentic Mongolian yurt in the heart of the Herefordshire countryside providing a unique experience of holiday camping, for up to four people. Slow down for a truly memorable holiday. A welcoming basket of locally sourced goodies awaits you. 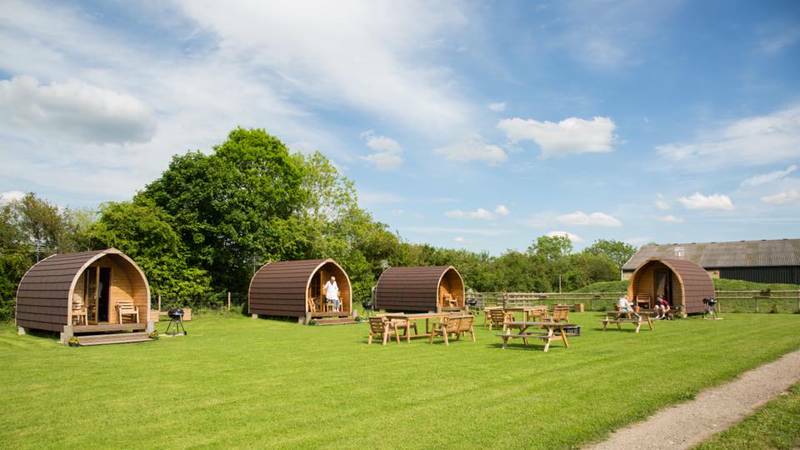 Come and enjoy beautiful surroundings in the Wye Valley AONB. 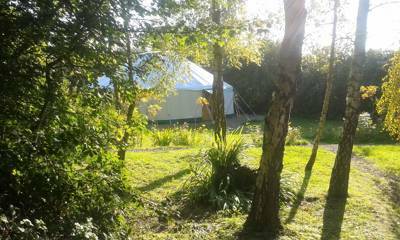 Enjoy the cosy interior of the yurt with its thick lining of yak felt and the special atmosphere of living in 'the round' Experience an open fire/brazier for outdoor cooking and a woodburner in the yurt. 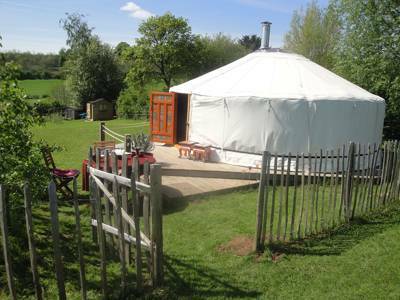 For latest availability and best prices for The Mongolian Yurt, please use the Date Search above. A beautiful place to get away from it all. 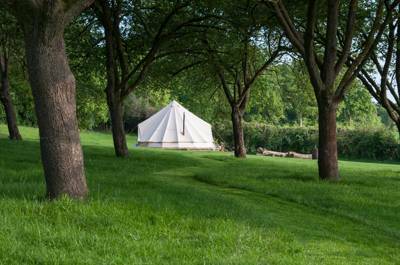 The yurt is beautifully equipped in a peaceful setting. There are walks in the lovely countryside on the doorstep. In a beautiful part of the world, secluded and really well equipped. Just returned from a long weekend. Weather was glorious and it was lovely to use the bbq and the fire pit. Our dog had a fantastic time , having a large space to roam but enclosed so perfectly safe. Everything to enhance the stay was provided including charcoal, firewood and eggs, milk, bread, biscuits, and fresh fruit. Kitchen was well equipped and clean. Only negative was that the mattress was a bit lumpy so the bed wasn’t as comfortable as it could have been, but you can put up with that for a few nights. Would definitely recommend and we will be going back. We had a fantastic stay over Easter for 3 nights. Bridget provided us with a lovely selection of basics, including hot cross buns, eggs and fruit, and the kitchen and bathroom are well equipped. We loved returning to the warm and cosy yurt after fantastic local walks. It was great for our dog too who had the freedom to run about in the fenced meadow directly outside the yurt without upsetting the sheep. Great. A wonderful weekend in a beautiful yurt. A warm welcome from Bridget (complete with fresh fruit, biscuits, eggs, milk, butter and bread), and the AONB is magical (complete with grazing sheep, pheasants, owls, woodpeckers, rabbits and butterflies). The yurt is surprisingly spacious, the woodburner very cosy on a chilly evening. We were lucky to eat, play, relax and walk in glorious sunshine. Thank you! Stayed for 3 nights. Such a beautiful yurt, in a spectcular part of the country. Beautiful walks on the doorstep, great pubs close by, and a wonderfully warm welcome from Bridget and Tim. 1 authentic Mongolian Yurt (sleeps 4). An extra tent is allowed if it was part of the group booking the yurt. 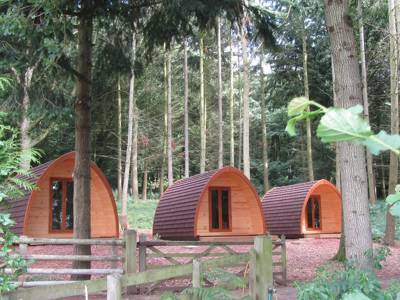 Glamping families, groups – yes. Well-behaved dogs are welcome but must remain in remain within the fenced area around the yurt because of the livestock in the adjoining fields. Yurt (sleeping 4) features kingsize bed, plus decorated Mongolian sofa bed with two mattresses. Exclusive use of kitchen, shower and loo in a nearby building. A brazier for outdoor cooking, along with firewood from the apple orchard is provided. Bridget runs her internationally recognised porcelain business from the smallholding. She is happy for people to watch her at work and visit the studio. Innumerable lovely walks to be had with the historic Offa's Dyke Path arguably the region's most well-known. If it's views you seek, the route from Black Hill to Hay Bluff takes some topping. Explore the Wye Valley by more gentle means with Canoe the Wye (01600 891100) river excursions. With a plethora of antiquarian bookshops and specialist bookshops, Hay-on-Wye isn't known as England's library for nothing. 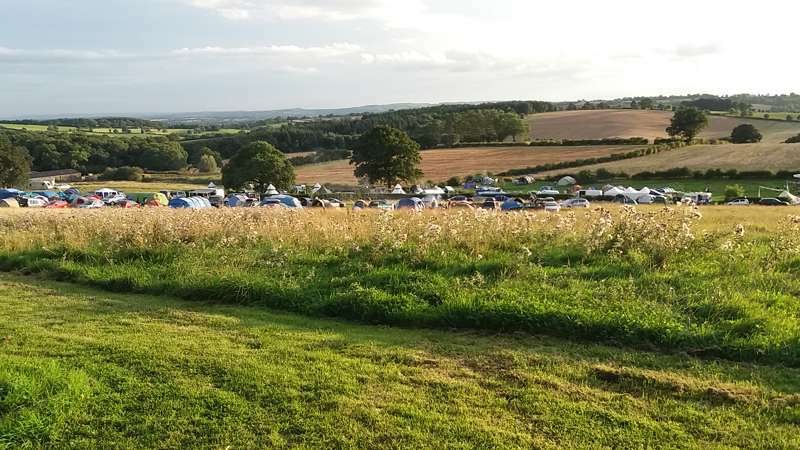 The world-famous Hay Festival runs from 22nd May - 1st June, while the Ledbury Poetry Festival runs from the 4th - 13th July. Bridget provides a welcome hamper of delicious local goodies. There's some cracking local pubs nearby too including The Green Man (01432 860243) in Fownhope and The Butchers Arms (01432 860281) in Woolhope. Both serve a fine selection of locally-sourced dishes in lovely surroundings. There's a local farmers market in Fownhope on Friday afternoons with producers of organic pork, beef and vegetables all within easy reach. Then site is located just of the B4224, just south of Hereford. Full directions upon booking. Nearest train stations are Ledbury, Hereford & Gloucester. Very limited public transport but good taxi service in Fownhope.